The Norwegian Cruise Line World MasterCard currently has an Informr score of 6.6 out of 10. This score is based on our evaluation of 3 sources including reviews from users and the web's most trusted critics. 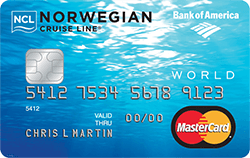 Norwegian Cruise Line World MasterCard is typically available to those with good credit scores (650 or greater). If you’re planning a trip with Norwegian Cruise Line, you could benefit from this card. With no annual fee and opportunities to earn points, it’s good for those who don’t want to spend a lot on a credit card. However, your points are best spent on the cruise line. Unfortunately, you’ll need to be a frequent cruiser on Norwegian to gain any ongoing benefit. If you’re not, you should consider a travel credit card with a larger sign-up bonus, similar earning and more flexible redemption options. Bank of America Preferred Rewards clients get an additional 25% - 75% points bonus on every purchase, applied to the base earn of 1 point per $1. If you’re looking for a credit card to use on the high seas, and accompany you on your travels, we recommend choosing another travel rewards credit card. The lack of features on the Norwegian Cruise Line Credit Card, accompanied by the low rewards rate, makes it an unappealing choice for most consumers.